Traditional Chinese Medicine (TCM) is the 5,000 year old practice of balancing our healing energy or "Qi" (pronounced "chee") with the use of acupuncture and herbal medicine. This ancient system views the body/mind/spirit as an energetic whole, united by a network of channels or "rivers of energy" through which the qi flows. Pain or disease arises when a blockage develops along one of these channels, like a dam might restrict flow of a stream. Acupuncture needles can be thought of as "keys" to unlock the floodgates, thus re-establishing the flow of qi and relieving pain. From a Western scientific perspective, acupuncture has been demonstrated to release endorphins, our body's own natural pain killers, and effectively treat a number of conditions listed below. An acupuncture needle is a fine wire, just slightly wider than a strand of hair, which is painlessly inserted through a guide tube into the body about 1/4 of an inch. It is left in place for 25 minutes while the patient rests in a warm, quiet room listening to relaxing music. Acupuncture is considered a physical therapeutic technique, while Chinese herbal medicine acts internally to balance metabolism. 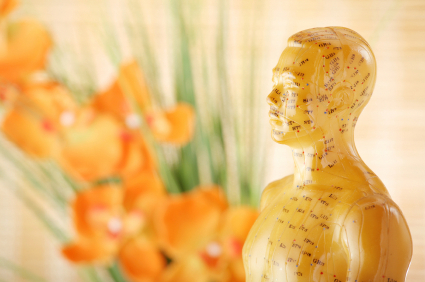 What conditions does acupuncture effectively treat? Low back pain * Neck pain * Sciatica * Tennis elbow * Knee pain * Periarthritis of the shoulder * Sprains * Facial pain (including craniomandibular disorders) * Headache * Dental pain * Temporomandibular (TMJ) dysfunction * Rheumatoid arthritis * Induction of labor * Correction of malposition of fetus (breech presentation) * Morning sickness * Nausea and vomiting * Postoperative pain * Stroke * Essential hypertension * Primary hypotension * Renal colic * Leucopenia * Adverse reactions to radiation or chemotherapy * Allergic rhinitis, including hay fever * Biliary colic * Depression (including depressive neurosis and depression following stroke) * Acute bacillary dysentery * Primary dysmenorrhea * Acute epigastralgia * Peptic ulcer * Acute and chronic gastritis.